It’s an annual event in which they choose their next case cookie by popular vote. This year’s choices are caramel apple, white chocolate cranberry, and gluten-free peanut butter chocolate chip. I loved the caramel apple, which tasted like fall; the white chocolate cranberry was fruity and sweet, and the gluten-free cookie was unbelievably moist and delicious. They were all incredible. It was unfair to have to make a choice. 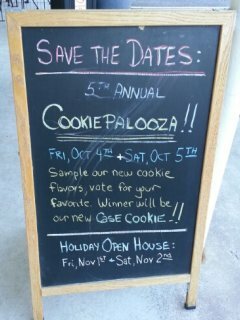 Stop by and try the free samples of the cookies, and vote for your favorite. In honor of the cookie event, all of their normal case cookies are on sale too, $1 each (not bad for a cookie half a foot in diameter; I’m not even exaggerating). Don’t worry about them running out of cookies; they’re baking up a storm. On a healthier note, here is week 18 of Breezy Willow’s summer/fall CSA. 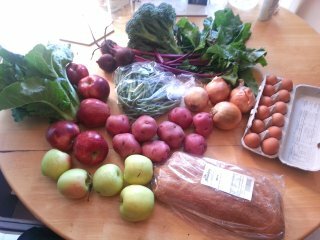 We got lettuce, Red Delicious and Golden Delicious apples, red potatoes, onions, green beans, beets, broccoli, eggs, and bread (Breadery sourdough). Red potatoes are perfect for stew. This hot spell isn’t going to last forever; I look forward to turning on the oven and making long-cooking stews and braises in the Dutch oven, and lots of sweet baked goods with apples and pears. Store-bought cookies are great and all, but whenever October rolls around, I start feeling like the girl in this comic. Have you heard of canned Vienna sausages? They’re tiny little cylinders made of a smooth meat paste, so processed that it’s all a uniform color and texture. They’re soft, salty, and squishy on the tongue. My parents always had a few cans around while I was growing up; I was always fascinated by how the seven cylinders fit neatly into a can, and when I was a kid, I enjoyed trying to remove one without damaging the others. The first one was always the hardest. They’re dirt cheap and last forever on the shelf; they don’t even need heating (though heating does help). If I were stocking up food for the apocalypse, I would make sure I had a shelf full of these. But I only had one can at home, bought as a joke a year or two ago. Last night, as the government shutdown loomed, I decided to embrace frugality and finally use up those Vienna sausages on some ramen (another classic budget food). I also added kale and a poached egg. It was surprisingly good. I started by dumping some stock cubes from our freezer into water: mushroom stock, chicken stock, and a smidge of duck stock. Then, when the liquid was at a rolling boil, I dropped in torn kale and cooked it until it was soft but still bright green. Out with the kale and in with the ramen; when the ramen was cooked, it came out as well, and in went eggs and Vienna sausages. The sausages heated in the time it took the eggs to poach. 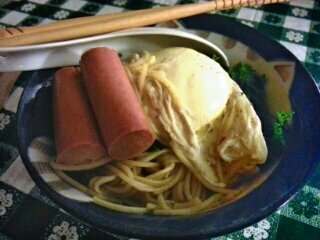 Okay, it’s not dollar ramen; the noodles were actually thin egg noodles with shrimp eggs. They’re my favorite dried noodle from Lotte. Also, dropping the Vienna sausages in the broth was only meant to warm them, but it actually helped the flavor by washing off the salty brine. And, gourmet ramen and all, I think I fed the family for under five dollars.